Isnaan in Sikhism is the third of the three pillars of fulfilled life, Naam, Daan, and Isnaan. Isnaan literally means cleansing practices. It encompasses all those deeds, learnings, processes, or religiosities that are potent in cleansing. The object of cleansing is the mind, body, and their environments, in that order. The cleansing deeds may be physical, cognitive or intellectual. The priority is to cleanse the inner faculties; mind, intellect, consciousness alike. Then comes the body to be washed from inside and out. The body cleansing alone has no impact on inner cleansing. Numerous undesirable impressions, ideations, and habits spread from person to person within and across cultures. In modern science, these are called memes. A meme is an idea, behavior, or style that acts as a unit for carrying cultural ideas, symbols, or practices that can be transmitted from one mind to another through writing, speech, gestures, rituals, or other imitable phenomena. Memes form clusters in the human brain. A collection of all these clusters together is described in the Sikhi phraseology as MANN. Supporters of the concept regard memes as cultural analogs to genes in that they self-replicate, mutate, and respond to selective pressures. Once they are formed they are hard to get rid of; therefore, the teachings of Isnaan. The human cognition and mind, that is Mann, are blackened with the dust of cultural memes and the narcissist memes accumulated over many cycles of cultural birth and death. Further, once MANN is smudged everything else around us is also smudged, and they maintain continuous reinfections that are hard to clean. The wise men noted that this was an enigma only a few realize. If the Mann or mind is Soiled, all is Soiled,: by bathing the body, the mind is cleansed not. This world is led astray by Misgiving, and rare is the one who knows the Truth. This is a vital point: people try to infect each other with those memes which they find most appealing, regardless of the memes’ objective value or truth. In the field of religion, the clerics class is one example of professionals who continually infect people’s mind with ever increasing religiosity. The immediate impact may not be visible. But, like the carrier of the cliff-jumping meme might never actually take the plunge; they may spend the rest of their long lives infecting other people with the meme, inducing millions of gullible fools to leap to their deaths. Historically, this sort of thing is happening all the time. Let your body and mind take a cleansing bath with the waters of Goodness to be followed by application of the scented oil of the Truthfulness that produces irresistible fragrance transmitting only welcome memes. The Divine Wisdom is the perennial spring of pure water of Life Force which is competent to remove impurities and paralysis of the human soul, and the Guru, therefore, is the only fulfillment and refuge for any person for him to transcend himself from humanity to divinity. While stressing on the treatment by Isnaan, the Eternal Wisdom also advised us to take the preventive measures so that we avoid the infection of the mind. Though your body and mind, practice only those deeds that do not permit soiling of the body and mind. Your mind may remain continuously alert and connected to the life giving awareness of the Creator manifested in the whole creation and its environment. This metaphor of a bath as Isnaan is meant to elucidate a major lesson on Sikh values and behaviors. The memes of cultural practices made up of Narcissism, and other selfish genes have been polluting the human Consciousness for ages. These memes are viruses that have been multiplying in the human mind and MANN throughout the cultural history of humankind. Their viral spread is badly needed to be disinfected. The crust formed from that infection requires scrubbing off by the deeds of Isnaan. There is no other way. While practices of Isnaan will cleanse the mind, the practice Naam and Daan (discussed in previous articles) will prevent those viruses from re-infecting the human spirit. It will ensure the everlasting health of the human mind and the universal consciousness. 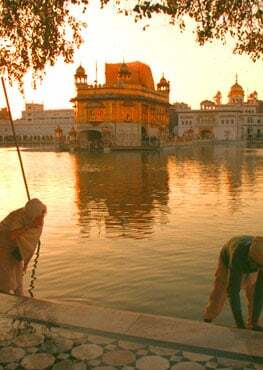 As Guru stressed, this cannot be accomplished by washing the body even in the waters at the places of pilgrimages. In Sikhism, cleansing of both body and mind are stressed. It is a total negation of toxic environment as well as evil thoughts. It is the opening of your heart, your mind, your life and your relationships to a process of detoxification. That process is described as Isnaan. Such teaching is religious and found in older scriptures. As Jesus is known to say, Wash and make yourselves clean. Take your evil deeds out of my sight; stop doing wrong. Isaiah 1:16.